Electronic hearing protectors are NOT better than passive ear muffs and ear plugs at blocking noise. When a high noise strikes the ear muff or hunting hearing aid, the device is designed to essentially turn off (or greatly limit its amplification, more commonly) becoming in that instant, a passive ear muff or ear plug. Electronic hearing protectors are designed to help you hear better while still blocking noise. 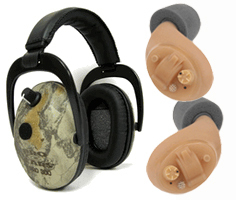 When you put on a set of shooting ear muffs or hunting hearing aids, you get "bionic hearing" in addition to noise protection, letting you hear far better with the shooting ear muffs or hunting hearing aids in place than you can with the open ear. The only reasons for buying shooting ear muffs or hunting hearing aids is to help you hear better while wearing them, than you can if you wear passive ear muffs or ear plugs. If you do not need to hear better while shooting, you will be served better by buying a passive ear muff or ear plug, because these are less expesnive, less prone to failure, do not require batteries, and they are not as heavy. Whether you decide on passive or electronic shooting protection products, you are at the right place. At Ear Plug Superstore, we offer one of the largest selections of both passive and electronic shooting and hunting products available anywhere in the world today, and our knowledgeable staff will be happy to help if you have questions: .